Japanese RAWs (thanks to Sakura84-chan!). What a lovely title page! Syaoran looks adorable here. And CLAMP is really into blue lately xD The previous color spread was also based on blue. My friend Sakura84-chan pointed out that those are frozen cherry blossom trees. Symbolism? First time we see Sakura in her rollerblades in this new arc. If you thought she was too old for them: think again. We are still in Spring in the manga timeline. It seems only a couple of weeks have passed since the beginning of the story, actually. In the original series, time went by a lot faster. We would be in a different season already. The Hanami scene gave me strong Kobato. vibes. This was a very Akiho-centered chapter. We learn that she shares Tomoyo’s singing talent (at least she’s different than Sakura at something). Everybody, and I mean everybody, is making sure to point out how nice and sweet Akiho is. It almost seem forced. So we learn a bit more from Akiho. She came to Japan with someone that is with her since she was little. Someone she considers “very special”. First thing anyone would think of: a relative! Maybe a parent. But no. That person, whoever they are, is not related to Akiho. Who would had stayed with her since she was little? An adoptive parent? Or maybe a creator? For that we would have to assume Akiho is a creature and that is a whole different theory. We know one thing about that person: s/he is a good cook! For having cooked that fabulous bento for everyone. Are we talking about an adult? Not really… at least slightly older than Akiho since they have been looking after her since she was little. Akiho has a plush toy, Momo, that is very dear to her. 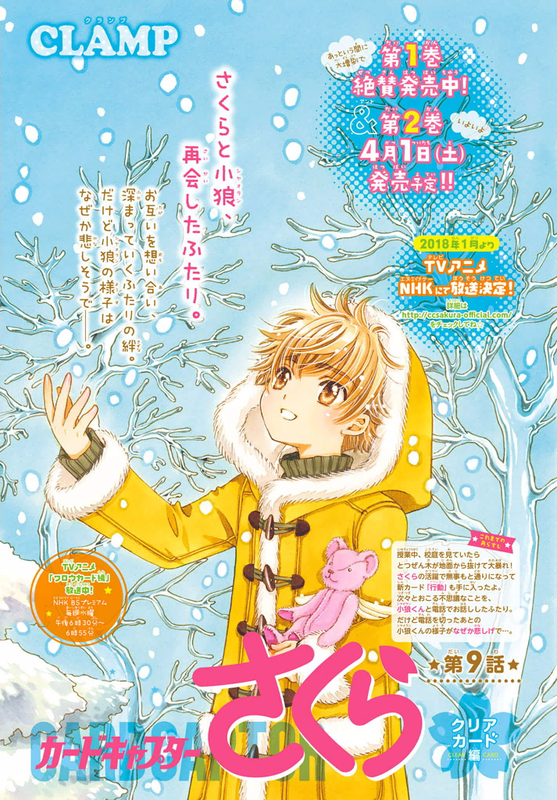 When the chapter scans leaked, I thought that that special person had made the plush toy (similar to what we have with Sakura and Syaoran), but that isn’t clear as of yet. We got a low 28 pages this time. I guess because this was likely the last chapter of volume 2, closing with a total of 169 pages. PS: I think this chapter was particularly very well-drawn! I fell Akiho’s love from everyone a bit forced aswell, I really want to know who she is and why on Earth Syaoran is so worried/sad. His whole personality changed, not sure whether is him being more mature or if it has anything to do with what’s going on. At first Chitose came to my mind when she said she was living with someone who was taking care of her, but then I realized it wouldn’t make sense, the “creator” theory is pretty interesting. And yeah, Momo can’t be an ordinary toy, the parallelism with Kero was strong. I also thought the same thing about the Kinomoto whatsapp group xD it must be LINE though….. I don’t know but that look in Akiho’s face made me think of a student-master relationship. I’m very happy with your comment, please come back! Finally the thing starts to get interesting. I hope the cut off the same formulas they’ve used with the old series. -Wouldn’t be just perfect if Akiho matches romantically with Tomoyo? I’d certainly love to see that! – Maybe Akiho came with somebody taht already appeared in the old series? -Nadeshiko thing worries me as well. I think Akiho’s guardian is someone new… but it’s just a guess. Sorry to say this but I am old guy now, and all the Syaron-Sakura thingy it is becoming so boring to me…. It’s nice to see a chapter post again! How many months do you think will it take us to see Akiho’s caretaker’s face, Chibiyuuto? Momo wears a crown that suspiciously resembles clock pointers. Is it just me, or does the “crown” look like it could be someone’s ring? It would be too large for someone Akiho’s age, but it would fit an adult’s finger. I would say that they really need to get into gear, being Sakura’s guardians and all — but then again, Kero fell asleep on the job and let the Clow Cards fly free, so maybe we shouldn’t expect that much from him. XD That said, I miss how involved Kero and Yue were in the beginning of the Sakura Card arc. They regularly used their true forms, they talked strategy together, they supported each other and Sakura in fights… Now Kero plays video games all day while Yue goes to college. I thought this chapter looked great, too, so I’m really looking forward to next month! How many months do you think will it take us to see Akiho’s caretaker’s face, Chibiyuuto? Not too long. Maybe 5-6 months? You think so? hummm. Interesting. I’ll keep that in mind. I was picturing it more like a bracelet. Yeah, Yue and Kero seem very useless so far… specially Kero. But I think/hope there is something in store for them. hahaha!! this made me laugh. yes to this! although yue is doing as sakura wishes. she wanted yukito to carry on as normal even though yue wanted to stay near sakura while all this is happening, but kero is doing as he pleases! when yue does come out he’s very sharp on the matter at hand. Ultimately, the SxS bento scene was postponed to next chapter I suppose: I am a bit surprised since I was expecting it to be some sort of valentine treat for the fans (but with no chocolate hahaha~). It’s funny how Syaoran didn’t know all about Akiho. He had to call Eriol to talk about it and Eriol himself had to use divination to learn more about her. It doesn’t seem like they were expecting her? And we’ll definitely see the bento soon. Maybe not on the next chapter since Sakura will want to make the best bento she possibly can, but it’s definitely in the horizon. The Nadeshiko thing is a little contradictory. In the Illusion episode she said that she didn’t appear because she thought things were “alright”, but then she appeared to check on Sakura. Does she think that things are “alright” now too? 1-Syaoran & Eriol don’t know as much as we think, and Akiho *is* involved (for better or for worse) in the disaster coming their way, but she is an unexpected/unknown factor that they didn’t catch. this im not too sure of. i thought that too, but what makes me hesitate is fujitakas unease. seems that since he was given half of eriols magic, he has seen nadeshiko a lot, who knows it’s maybe even every day she came to him. and his words in what chapter was it? the first or second chapter when he notices something is off with sakura and nadeshiko, he too questions if her no show is cause things are indeed alright or if its for another reason. again he looked worried about sakura and nadeshiko this recent chapter. maybe nadeshiko is pulling the same move as eriol? i also thought of momos time crown thing as a ring for someone. and gota say i love the name momo! 😀 and momo is so pretty! and throwing in a random thought that crossed my mind about akihos guardian person, the fact that this person is an excellent cook and good at crafts reminded me of all the Li’s that clamp have shown have these remarkable artistic skills. all the syaorans, clow Reed, watanuki, and via clow is eriol, fujitaka, touya (and sakura who is improving a lot a cooking). so is this guardian a Li family member? i know the Li’s are mostly Hongkong but maybe this one lives in japan? watanuki does! im dying to see more Li family members, especially syaorans mum! Great chapter! The drawings are getting better each chapter. Lovely to have a normal every day life chapter. I wonder if fujitaka is sensing more than he lets on… He’s probing Sakura a little more. Akiho is way too err… Well… nice? and everyone is quickly won over by her just like with sakura. Great theory with akiho being a creation! I’d rather she was that than going down the same route as new character = bad guy. So momo and akiho might be parallels to kero and yue? Speaking of, after yues words, Sakura is more onto what the dream figure is after. Did Sakura fall into the dream world at the diner table in front of yukito and touya by the way? I wonder if they will notice? She’s mirroring watanuki with his dreams while awake huh? And also the no aura theme. o momo and akiho might be parallels to kero and yue? Did Sakura fall into the dream world at the diner table in front of yukito and touya by the way? I wonder if they will notice? She’s mirroring watanuki with his dreams while awake huh? Xiaolang has it all by himself this time, a privilege only Sakura, Tomoyo and him have been allow to. They are all definitely getting along with Akiho too well, too fast, there’s definitely magic at play here. Talking of the devil, her’s Akiho! with a companion, Momo, who is playing plushie. Is it a creature like Kero-chan and Suppi? … or a supervisor like Ioryogi? With the clock hands on its… let’s call it earband… it feels more like the later. That’s right, Yukito was eating like a monster, it’s coming back now. I really need to reread the first series. So nothing wrong with Yukito either… Sakura is trying to find clues, but there’s really none to work from. And she pass to the dream world… I hope she won’t hurt herself. Touya is going to panic. X like clockwork and even genuine clocks ticking. On the very last frame, the elegant hands in the background indicate 2:35, I wonder if there is any signification in this exact timing. Anyway, it remind me of Kobato and her bottle she had a limited amount of time to fill. Akiho have been moving from country to country, maybe she has something to collect before the time run out. Really? I have no recollection of Wei being a creature…. e elegant hands in the background indicate 2:35, I wonder if there is any signification in this exact timing. And the clock crown in Momo’s ear seem to indicate 2:00 o’clock. I also wonder if that’s random or if there’s any significance to it. Anyway, it remind me of Kobato and her bottle she had a limited amount of time to fill. I had the same thought ! Anyway, it remind me of Kobato and her bottle she had a limited amount of time to fill. Akiho have been moving from country to country, maybe she has something to collect before the time run out. Regarding the clock, there might be significance about it and the new key. Wind-up clock need a key (winder) so it can function. You use the key to wind up a dead clock and it will be alive. The mysterious figure might need the key, and that’s probably why they tried to drag the key from Sakura in her previous dreams…? Hi! Excellent your point of view and explanation of this chapter, good work. I can not wait for the identity of Mysterious Cloaked Figure to be discovered, perhaps for the first time it has been shown, out of the world of dreams, in that form of “momo”? Please, could you tell me when the next chapter comes out? I’ll be on the lookout. Meanwhile I hope that on Monday, Watanuki can solve the problem with Zashiki Warashi. Ok, I need to leave this comment here because if I’m going to wait some more, I know I will forget about it and procrastinate until next chapter (and I don’t want that). 4) Nadeshiko disappearing from Fujitaka's view definitely means something: could it be that Fujitaka has lost his share of Clow's powers? 5) Next time Sakura enters the dreamworld at whatever time of the day, she wins a trip to Watanuki's store. Guaranteed. 6) Bento. I'll just say that, Ohkawa. Now on to another excruciating month of wait…. 6) Bento. I’ll just say that, Ohkawa. could it be that Fujitaka has lost his share of Clow’s powers? lol! true true, but i always thought it was her choice so to speak. she’s got a real phobia of ghosts thanks touya. didnt eriol say something like if she wants she can see ghosts, but her fear is what blocks her seeing them. or she can choose just how much of the future she sees. in other words she as more control than clow did with some things. Yeah, I’ve also thought that she never saw ghosts but rather felt them because she subconsciously didn’t want to see them…and since she’s more in control than Clow….makes sense! I’m gonna play the opposite of Ohkawa’s attorney here but I think Sakura would hardly feel afraid of her mother’s ghost. The reason why The Illusion took the form of Nadeshiko was because Sakura wanted to see her so badly, too. I think Sakura’s inability to see her mother’s ghost might be some clunky writing on Ohkawa’s part — it would totally change the Kinomoto family dynamic to have Nadeshiko play an active role in everybody’s life, so maybe Ohkawa is trying to minimize her presence and put her in only when necessary. I’m guessing that the issue is more on Fujitaka’s end than Nadeshiko’s, yeah. That would explain why CLAMP hasn’t had Sakura open up to him about her magic and what’s currently going on with the Clear Cards — it’s not as if Sakura would be aware that Fujitaka was losing his powers, but rather that Ohkawa didn’t want to deal with that plot point. Yes, CLAMP is pushing it. Nonetheless, I do not know if there is a ‘meaning’ to it or if this is how Clamp’s remembers CCS atmosphere being: so … sugary sweet? ^^; I’m obviously not against it, this is part of the spirit of the series that I love, but they went too far with Akiho’s introduction. 4) Nadeshiko disappearing from Fujitaka’s view definitely means something: could it be that Fujitaka has lost his share of Clow’s powers? Sounds long, but it would all enter in 2 pages. Besides singing well Akiho cannot cook neither find places, I bet that she’ll be bad at sports as well. Just my imagination, but can Akiho purposly want Sakura to bring Kero to school with her by showing Momo…?